LEGION Scotland and Poppyscotland are calling on communities, families and friends to help spread the message to D-Day veterans who are eligible for a fully-funded trip to this year’s 75th anniversary commemorations in the UK and Normandy. Scotland’s leading Armed Forces charities, together with The Royal British Legion which operates in the rest of the UK, plan to take up to 300 Normandy veterans to France on a specially chartered ship to mark 75 years since the original D-Day landings. Some 175 veterans, who helped liberate France during the Second World War, have already signed up to travel on the MV Boudicca, but there is still the opportunity for more to join them, with the deadline for applications having been extended until Monday, 4th March. Dr Claire Armstrong, chief executive of Legion Scotland, said: “We believe it’s important that all veterans who contributed to the liberation of France who want to attend the commemorations for the 75th anniversary of the D-Day landings in Portsmouth and Normandy are able to do so. “We are delighted at the response we have received so far, but we still have space for more veterans to join their comrades who shared in those challenging wartime experiences in 1944. Most importantly at this stage, we don’t want anyone who wishes to take part to be left behind. With the majority of available accommodation in Normandy already booked, the voyage will provide a comfortable and fully-supported travel package for those veterans who haven’t made plans. The MV Boudicca will depart from Dover on June 2nd, taking in events in Poole and Portsmouth, before crossing the English Channel for the veterans on board to attend the commemorations taking place in Normandy on 6th June. Veterans interested in travelling on the ship are invited to contact The Royal British Legion for an application form, which can also be downloaded from the Legion’s website at www.britishlegion.org.uk/community/d-day-75/. This can now be returned by the new deadline of Monday, 4th March. Each veteran will be entitled to door-to-door travel for themselves and one guest or carer, at no cost. The journey is being funded by The Royal British Legion’s LIBOR grant, in conjunction with the Ministry of Defence and Arena travel. * For further information and all media enquiries, please contact David A. Findlay, PR manager at Poppyscotland and Legion Scotland, on 079797 35611, or email at d.findlay@poppyscotland.org.uk. 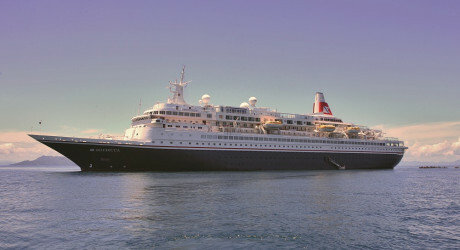 * Operated by Fred Olsen Cruise Lines, the Boudicca is named after the British warrior Queen. The ship was designed for world cruising and was extensively refurbished in March 2018. Images and video footage of the Boudicca are available from the RBL Press Office. All veterans allocated places on the ship are subject to ongoing medical clearance. Veterans can contact Arena Travel with any questions about the boat on 01473 660 800 and apply for places via www.britishlegion.org.uk/community/d-day-75/. The Royal British Legion’s initiative is driven in part by a determination to help veterans overcome any potential issues with a lack of available accommodation in Normandy in June. * The Allied invasion of Normandy, known as ‘D-Day’, took place on 6 June 1944, and was the largest amphibious assault ever launched. More than 80,000 British and Canadian troops took part in the invasion on the beaches alongside United States Forces, in an Allied invasion force of nearly 160,000. Another 23,400 British troops were landed by air. Supporting the invasion were more than 7,000 ships off the coast (including the famous HMS Belfast) and 11,000 aircraft. In total, British and Commonwealth casualties (killed, wounded or missing) on D-Day numbered approximately 4,300. The invasion was the first stage in the liberation of Europe from Nazi occupation, which ultimately led to victory for Allied Forces in 1945. * Poppyscotland provides life-changing support to the Armed Forces community. Money raised from the Scottish Poppy Appeal and Poppyscotland’s year-round fundraising enables them to deliver support to members of the Armed Forces community in Scotland by providing tailored funding and assistance. The charity also funds services in advice, employment, housing, mental health, mobility and respite. Please note that we are known as ‘Poppyscotland’, and not ‘PoppyScotland’ or ‘Poppy Scotland’. For more information, please visit us at: www.poppyscotland.org.uk. * Legion Scotland is the daily use name of the Royal British Legion Scotland, the largest ex-service membership charity in Scotland working at the heart of the community supporting veterans of all ages and from all conflicts. With 148 branches, 62 clubs and more than 25,000 members, Legion Scotland, working in partnership with other organisations, provides veterans in the community with three key services covering remembrance, comradeship and befriending whilst supporting the welfare services and fundraising initiatives of Poppyscotland. * There are three key areas to Legion Scotland’s work, namely: Comradeship, including events, clubs, sports; Wellbeing, including befriending programme, a range of grants, disablement pensions support and advocacy service; and Remembrance, which includes Remembrance events in November and commemorative events across the year. This includes a primary school competition and the Best Kept War Memorial campaign.